I go to the grocery store every day during my lunch hour at work and I usually have a pretty steady routine of what I order. Some days it's baked chicken and vegetables, other days I get a roast beef wrap. Today I decided to go with the wrap and was surprised at checkout to find out the price had risen from $5.99 to $6.99. The lady at the register told me the price had gone up this morning on all subs. This is the new reality of stagflation in America. The economy does not improve fundamentally in terms of job creation, but the cost of living has now begun to rise. During the initial stages of inflation everything feels good. Stock prices begin to rise, optimism enters all asset markets, and banks enjoy the ability to borrow at 0% and invest at a higher rate. The problem is that money is like water flowing down a stream. The Federal Reserve can pump trillions of printed dollars into the economy, but they cannot control where it goes once it gets there. During the 1990's it went into the stock market. In the 2000's it went into real estate. In this decade I believe it will move into commodities, where it found a home during the second half of 2010 and has not stopped flooding in. Agriculture (food), Energy (gasoline), Metals (gold), Cotton (clothes), and just about every tangible good in the world has surged in price over the last 9 months. 1. Inflation cuts into company "margins." Let's say my grocery store was making $2.00 on every sub they sold at $5.99. With food prices surging they are now only making $.30 cents and were forced to raise prices to $6.99. This price increase means they will sell less subs at a lower margin = lower total profits. 2. The poor around the world who can barely survive now cannot survive. A protester in Tunisia on January 3rd of this year set himself on fire in protest of rising food prices. The protester in Tunisia is now considered the spark that created the revolution in Egypt, which has since spread across Africa. 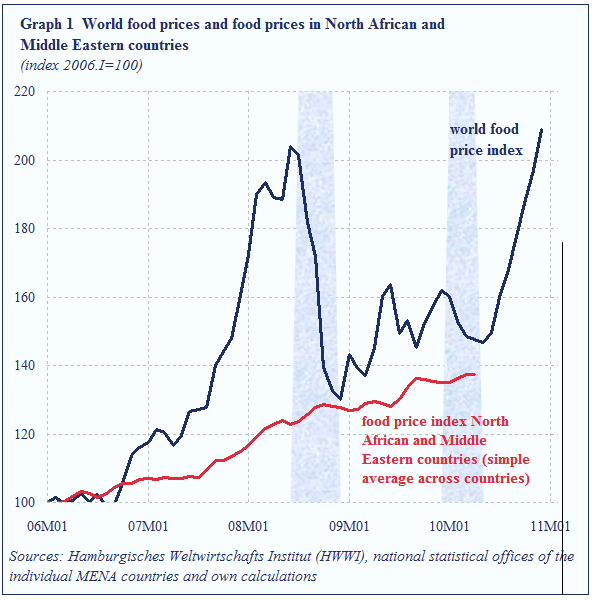 While the media cannot connect the dots, our Federal Reserve is the direct link to food prices rising around the world. The first part of the inflation process (stock and real estate prices rising) is the "good" part of inflation. The second part, the cost of living rising, is the "bad" part. We have reached the second stage, called stagflation by the market, and we have a Federal Reserve Chairman in Ben Bernanke that will not slow the printing press for a second, even as millions die of starvation around the world, to ensure that the bankers here in America continue to collect above $700,000 in total salary every year. We can only hope that the confidence in our debt markets for our bankrupt country can hold on for just a little longer. When the confidence is removed from a bankrupt country, well, I can just show you what it looks like with a live video stream of the streets of Greece just this afternoon.